Over the last few years we’ve experienced the rise and rise of a show that nobody thought would be anything like as popular as it would’ve been. I’m talking of a programme that primarily focuses on cake, bread and biscuits that of course being The Great British Bake-Off. After transferring over to BBC One last year, The Bake-Off has gone from strength to strength and I did fear that now on its seventh series it would be running out of steam. However from watching tonight’s first episode it’s plain to see that this isn’t the case and that the beauty of the Bake-Off is the fact that it never deviates from its simple formula. This year’s first Signature Bake saw the bakers tasked with making a drizzle cake which we’re told is Paul's favourite. Our hosts started on the innuendos straight away with Mel telling the bakers straight away that their cakes had to be moist. Right away you got the impression about the characters of some bakers including loveable retired headteacher Val who went for the classic orange and lemon drizzle cake that she'd been baking for years. Unfortunately for Val her experience didn't count for much and after the three challenges she seemed like one of the weaker contestants. Meanwhile biking baking banker Selsai initially forgot to put the cinnamon in his cake but added it to his frosting instead. Ordinarily on a show like the Bake-Off this would spell doom for a contestant however confident Selasi's fate changed for the better as Mary and Paul both loved his cake. This wasn't true of many of the bakers including the youngest of the gang, 19-year-old student Michael, who presented a fine ginger cake but with no drizzle to be seen. Top of the class after the first challenge were garden designer Jane with her simplistic lemon and poppy seed drizzle cake and Benjamina who flavoured her cake with pistachio. When Mel and Sue told the bakers that Paul and Mary wanted twelve Jaffa Cakes I thought one of their number would just pop down the shop. But instead the bakers went through what looked like an arduous task of making an orange syrup and dunking just the right amount of chocolate on top. Andrew managed to get all of his the wrong way up. Meanwhile Val had an ingenious idea of making her Jaffa Cakes more dainty by cutting them down needless to say both she and Andrew ended up down the bottom of the table when the judgements were handed out. Again it was Selasi who came out on top after not running round like a headless chicken and producing some Jaffa Cakes that looked in someway edible. The final challenge for the bakers was to create a mirror glaze cake or in layman's terms a big shiny cake. As you can imagine a lot of the bakers went hard to impress with youngster Michael adding Matcha Tea to his cake unfortunately his plans came unstuck after Mary Berry told him that his secret ingredient tasted like grass. P.E. teacher Candice's grand structure had a lot to praise however her failure to manage the basic Genoese sponge base put her in trouble. Again simplicity seemed to be the key as it was Jane's chocolate orange cake that earned the biggest praise from the judges despite stellar efforts from both Selasi and Benjamina. Unfortunately Val got a see-me from Paul Hollywood after tasting her showstopper that came with her world famous four fruit frosting. Star Baker: After impressing with both her signature bake and showstopper Jane was rightfully awarded with this week's Star Baker. Eliminated: Church minister Lee whose bells of St. Clements drizzle cake failed to impress but I'm guessing the baking classes he teaches at the church will at least be a little busier now. It Seemed Like a Good Idea at the Time: Michael's Gin and Tonic drizzle cake was obviously a rouse to ingratiate himself with gin-loving Mary unfortunately the booze overpowered all the other elements of his creation. One to Watch: Selasi for me has to be one of the favourites with his cool, calm and collected approach being a rarity in the normally panicked environment of the Bake-off tent. Next to Go: I'm shocked that Val survived the chop however I'm guessing that she'll won't be long for the tent. 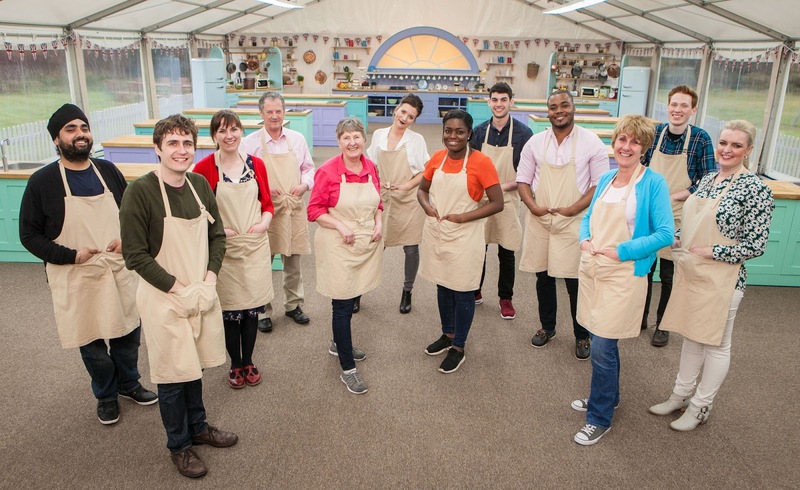 Next Week: Who'll snap under the pressure as the remaining eleven bakers try their hand at biscuit-making?